I love fabric and using it to create a mood or season is so easy to do and really enhances all of your decor. 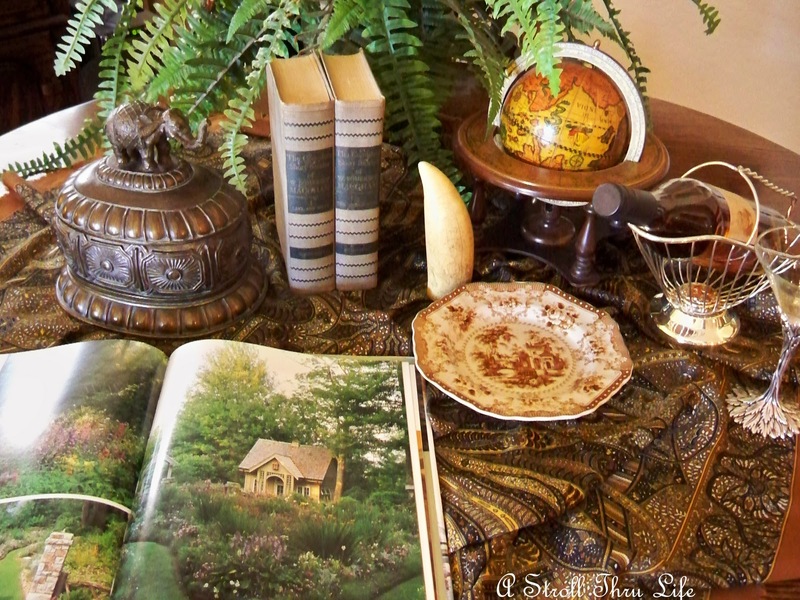 Look through your scarfs and shawls or create a few table toppers that you can use in unusual ways to add some fall color and do some soft scaping to enhance your displays. Here I have used a shawl to add a little interest and drama to this vignette. 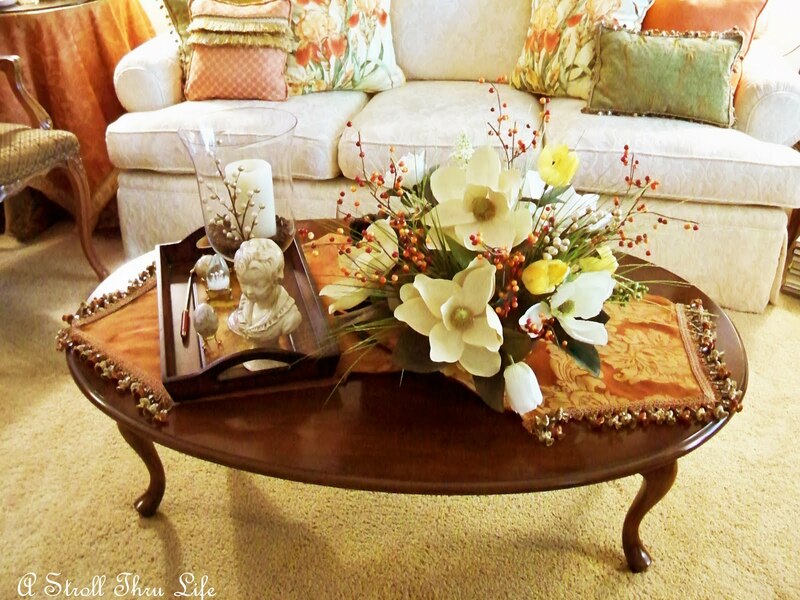 A table topper square scrunched on the coffee table adds a ton of interest and color. A table runner achieves the same effect. Mandy @ Wise Designs and Inspiration uses a shaw on her buffet to add color and interest to her vignette. So much prettier than just bare wood and more interesting than a straight tablerunner. You have all seen that I use table squares on my dining table all the time. Here I've used one of my favorite shawls and created a totally different look. 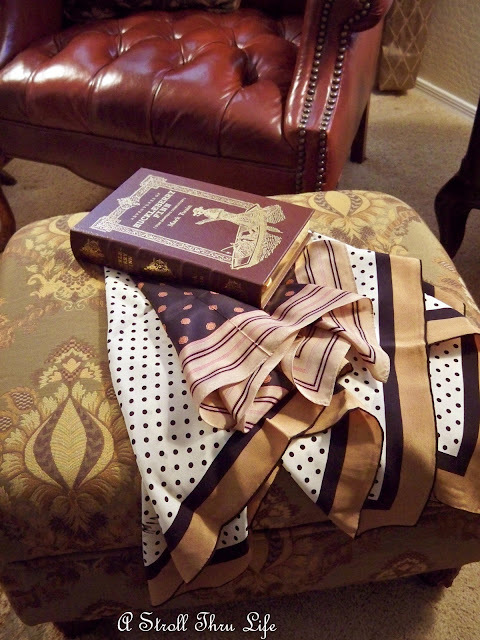 Same shawl and a scarf laying on an ottoman for added color and pattern. Two different scarfs for a totally different look. A peek at a tabletop that I am working on, again usuing a scarf. Look through your stash of fabric, your old scarfs, shawls or whatever you have and see how you can add a little fall color or change things up with a little soft scaping in your own home. These table tops look great. I just wish that fall weather was right around the corner!!!!! I never thought to use a shawl or scarf...I have plenty! Thanks, Marty and have a wonderful weekend!! That's a great idea. Everything looks so classy and finished. All your vignettes are lovely! The shawls and scarves make a gorgeous backdrop to them. Beautiful as usual! It looks beautiful.Have a great weekend. 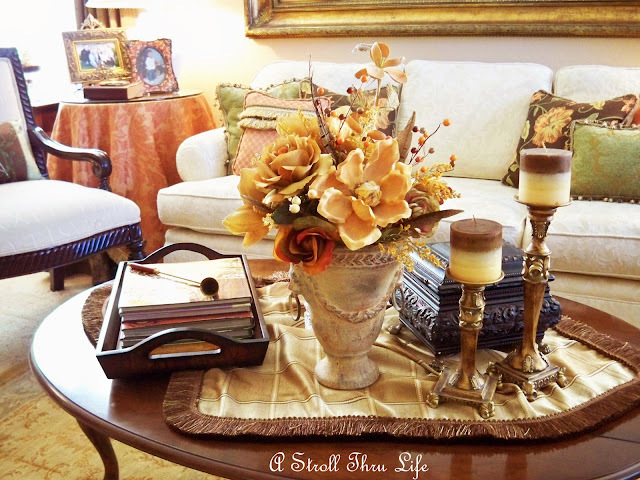 Beautiful Fall Vignette's! I am gathering my fall decor slowly. Will start around the end of September to decorate my home! I love it when folks use table squares, especially when they have gorgeous tables like yours, Marty! My dining table is an ugly brass and glass monstrosity from the eighties, so I like to cover mine completely with a tablecloth. Great idea! 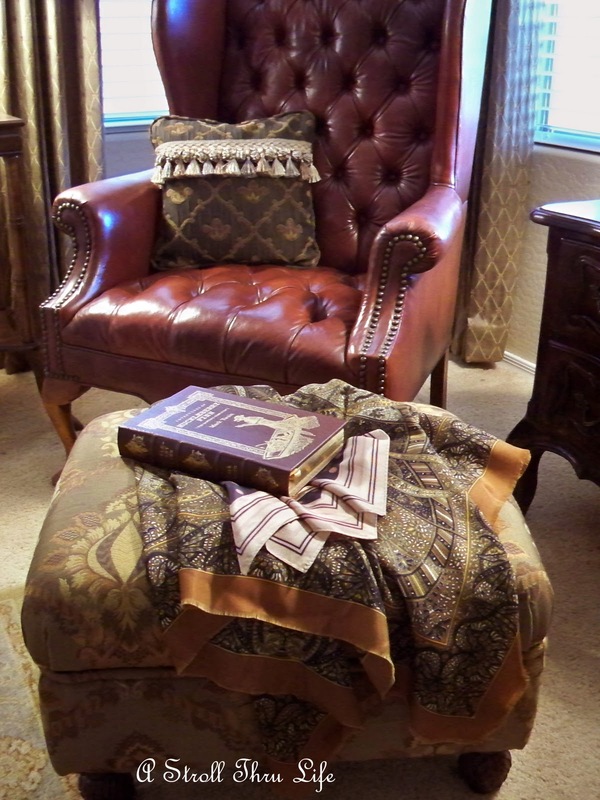 I always notice the fabric use in your vignettes. I love the way you use fabric in your vignettes. I've tried. Mine usually looks as if I accidentally left a scarf on the table. What a great idea! I need to do that! Haven't gotten in the Fall mood yet still pretty hot in Florida! One month and we'll see some relief. Thanks always for your wonderful inspiration Marty! Your home is just so perfect for warm fall colors. Everything looks beautiful. Happy Weekend Marty!! I LOVE this idea. I think I'll have to go look for some scarves now!! What beautiful photos. You home is just so classy and elegant, yet makes you want to curl up and enjoy a good book with a cup of hot tea!! Thanks for posting! Have a wonderful Labor Day!!! And all my fabric is packed up! I'm going to miss seeing it. But won't be moving until the end of October. Oh well, can look at yours. These all look so pretty. Beautiful! Who would have thunk it. You are a pro at this, just like in the magazines! Lovely as always. 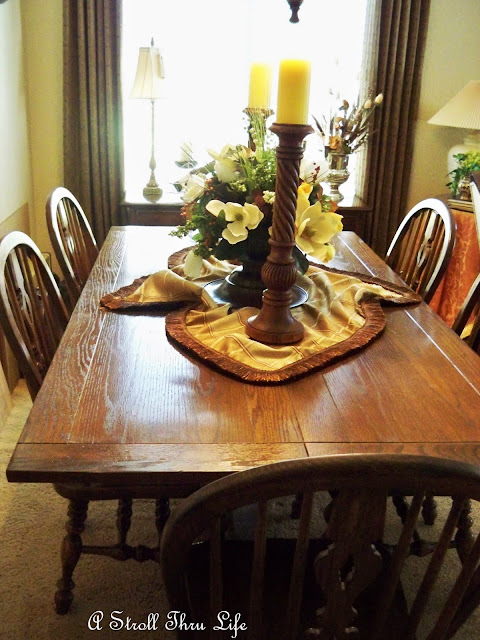 I always notice your fabrics and how well they play up your tabletops. Have a great weekend. Loving all your pops of fall color Marty! You always have such beautiful displays!! You know I love fabric, Marty! I just recently saw a scarf that I almost picked up to use on a table. Marty, such beautiful scarfs. You've given me some inspiration. I am so ready to decorate for fall. Great idea but unfortunately I don't have such great shawls like yours! I will be on the look out. Beautiful, Marty! 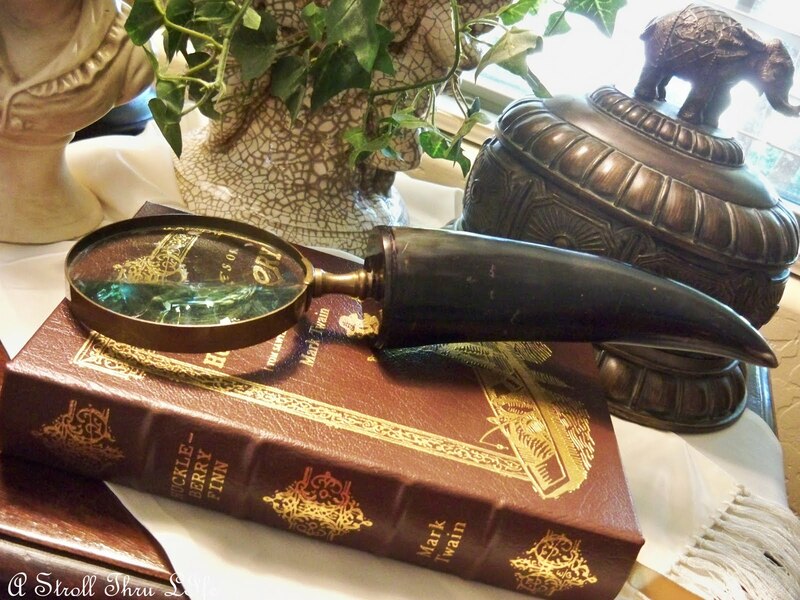 I also love the visual interest adding a throw, runner, scarf or other materials adds to tabletops. Love it on your ottoman, too! Thank you for the wonderful inspiration! Pretty scarves and great ideas, Marty. Hope you have a nice Labor Day. 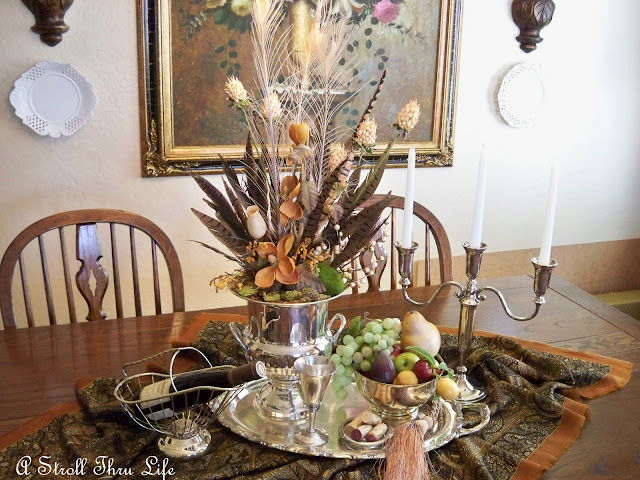 Love the beautiful fall tablescapes! Fall is my favorite time of year and I am ready to begin decorating!! Love your beautiful examples of draped fabric! Gorgeous. I am looking for a leather chair like yours. Where did you purchase it?